Dance Floor bascule R & B avec un grand revers de la médaille! Un must! Al Downing is definitely Big. Obviously! Just observe his girth and over all build. I, however am referring to his musical prowess, not his physical stature. Al is big even though he hasn't sold millions and millions of albums yet, hasn't acquired Grammys yet, or achieved household name status yet. In the competitive music business world Al has big things going for him: his big voice, his big personality, his big stage presence, his big ability to create musical excitement, and that big big commodity he possesses called soul. Al's talent is so big that by comparison it dwarfs that of many of today's so called super stars. This album aptly titled 'Back To My Roots' is the fruition of a musical journey that began in America's heartland in the early 50's. Al penned all the songs which shows he has many other talents. He spent his early years on a farm in rural Oklahoma. While a young teenager he and his family (10 brothers and 2 sisters) found a piano in a junkyard, salvaged it and began tinkering out his musical legacy. Radio broadcasts of the day served both as his inspiration and teacher. In a short time he had mastered the 'Licks' of black rythm and blues, favorites of the era. During this period he also developed a fondness for the Country Music heard on the Grand Ole Opry. He grew to love Country Music by working in the hayfields on the farm, loading semi-tractor trailers that came up from Texas and all they played was Country. This fusion of southern music as you will hear, accounts for the Big Al Downing style and sound. 'Back To My Roots' is also a major part of Al Downing's live shows. In the early years gaining work with bands required Al to imitate the stars of the day (Fats Domino, Ray Charles, Little Richard, Elvis, etc.). Al still does great impersanations of these stars in concert, along with parodies of today's biggest Country stars. Over the years the Big Al Downing sound has touched just about every category of recorded music. Amazingly, doing so without selling out just to jump on the 'band wagon' of some fad or craze. In the 50's (down on the farm), in the 60's R&B soul ('You Never Miss Your Water' with Esther Phillips), in the 70's ('I'll Be Holding On') Disco Dance, in the 80's two Top Ten Country tunes ('Mr Jones', 'Touch Me') and now 'Back To My Roots' puts it all together. From the dance tune 'Sneaky Freaky People' to the bluesy 'I Always Come Back To Loving You' Al never strays far from the roots.The Big guy strikes again. He just keeps getting bigger and better. Q100 Radio, Southbridge, Ma. 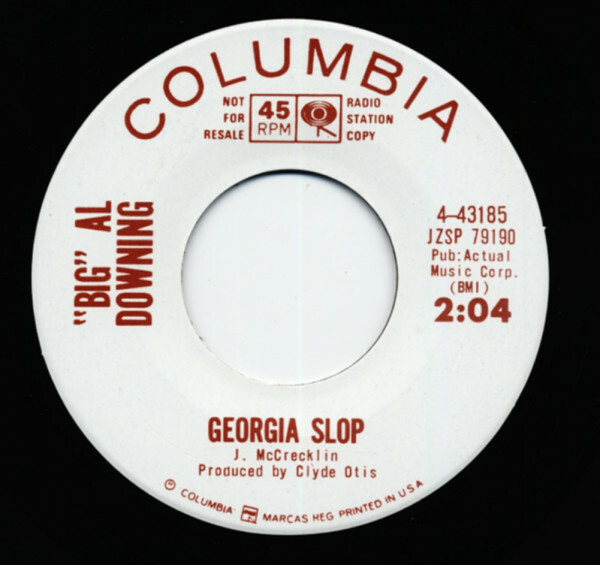 Évaluations de clients pour "Georgia Slop b-w I Feel Good 7inch, 45rpm Repro"